So, can you distinguish between a domestic dog and a coyote? Be honest. If you are like many Americans you might, in fact, have great difficulty identifying a “real” coyote. So much so that there are numerous websites dedicated to explaining the difference between these two species. But one magnificent animal, the prairie dog, appears to not only be able to distinguish between the two on sight, but can clearly communicate to her family within a matter of seconds which of the two—dog or coyote—is nearing the colony. Prairie dogs are members of the squirrel family of rodents native to North America. Except for a few captive populations in the Eastern United States, prairie dogs are found exclusively west of the Mississippi River. They earned their name from settlers traveling west who thought their chirping sounded similar to dogs barking. In all, there are five different species of prairie dogs: Utah, Gunnison, white-tailed, black-tailed and Mexican. Prairie dogs are highly intelligent, social creatures. Families called coteries or clans, depending on the species, live together in large colonies or "towns" that can span hundreds of acres. Members of these towns take care of one another and help defend the group from predators. 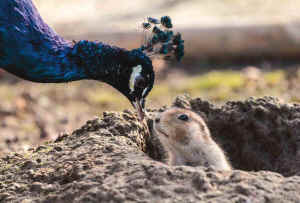 Members of a family group also closely interact through oral contact known as "kissing" and grooming. Prairie dogs are one of the most important (keystone) species in a short-grass prairie ecosystem. They provide both habitat and food to many types of prairie animals. Abandoned burrows are frequently used as homes by owls, rabbits, ferrets, badgers, weasels and snakes. Prairie dogs' burrowing also aerates the soil to allow for more water penetration, while their nitrogen-rich dung helps maintain soil quality. Possibly as much as with any other species on Earth, the relationship that humans have cultivated with prairie dogs reflects both our ability to respect the natural world and our seemly insatiable desire to destroy it. On the one hand, we cannot help but be amazed by these animals. To observe the complex social structure of the colony—with individual prairie dogs taking part in larger group responsibilities while simultaneously interacting with others on a personal level—is to understand and respect what life on Earth is suppose to be all about. No wonder prairie dogs are constantly one of the most researched animals in North America, are viewed by thousands in the wild, and an absolute favorite among schoolchildren to study in ecology class. 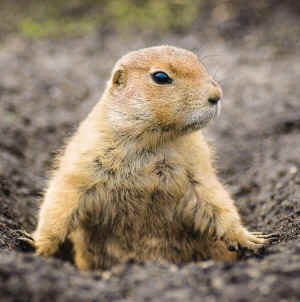 On the other hand, perhaps no other animal on Earth is as persecuted as the prairie dog. To many—particularly western ranchers and landowners—the animal is viewed as nothing but a pest. Wild claims are made that the prairie dogs and their burrows destroy the land and injure livestock that step in burrows. In truth, prairie dogs protect the land by enhancing the native prairie, and even cattle are smart enough to mostly avoid burrowed land. No, prairie dogs, like many Western animals, are despised because they inhabit land sought after by ranchers who desire to privatize, and destroy, seemingly every square inch of the West. Sadly, at the urging of landowners, thousands of prairie dogs have been trapped by the government—literally vacuumed from their burrows—and relocated into confined environments. Millions more have suffered an even worse fate—being intentionally trapped in their burrows before being drowned or exposed to poisonous gas. And every year, these animals are part of a blood sport known as “red mist.” Shot indiscriminately with high-powered riffles, the shooter relishes in, and often films, the prairie dog as it explodes into a mist of blood. Most species of prairie dogs are offered no legal protections from the federal, state or local governments. As such, the protection of most of these animals rests with activists. Over the past couple decades, activists have persuaded agencies like the U.S. Forest Service, the U.S. Fish & Wildlife Service, and the National Park Service to set up protected areas on public lands to protect prairie dogs. One species of prairie dogs, the Utah, however, has historically seen the most persecution. Indeed, the Utah prairie dog teetered on the brink of extinction in the 1970s. As the name indicates, these animals are native to Utah, a state that has generally taken very pro-property, anti-wildlife positions. Before being listed as endangered under the Endangered Species Act in 1973, only a few thousand Utah prairie dogs remained in the wild. The destruction of these animals and their great nation was due in large part to savage killing and habitat destruction by humans who desire to have the Utah prairie dog’s land for their own agricultural and grazing activities. Due to protection under the ESA, the number of these amazing animals has increased 10 fold, with an average of close to 34,000 individuals living in the wild today. While much needs to be done to improve the lives of these animals, there are those who would like to end all legal protections afforded the Utah prairie dogs, and see these amazing animals completely eradicated from public and private lands in Utah. This past April, attorneys with the Pacific Legal Foundation —an anti-environmental, pro-property legal rights group—filed suit against the Fish & Wildlife Service on behalf of a group of property owners in Cedar City, Utah. This suit challenges the listing of the Utah prairie dog as a protected species under the ESA. The group, which calls itself People for the Ethical Treatment of Property Owners, claims that the listing of the species infringes on its members' constitutional rights. This lawsuit is serious, and if PLF wins, it would leave no legal protections in place for Utah prairie dogs. We know from past experience what this means—almost certainly the road to extinction. Friends of Animals believes that the fate of these animals can’t be left in the hands of the Fish & Wildlife Service, an organization that often capitulates to the demands of property owners and anti-animal groups like PLF. This is why our newest project—the Wildlife Law Program—has chosen the protection of prairie dogs as one of its cornerstone missions. This past July, lawyers for the Wildlife Law Program filed papers in the U.S. District Court in Utah, demanding that Friends of Animals be allowed to defend the Utah prairie dog against the frivolous attack by PLF. You can be sure that Friends of Animals will aggressively pursue the right of prairie dogs and other wild species to live their lives free from human interference.